Preston Plucknett's Preston Field, or North Field, was originally a large Medieval manorial field along the western parish boundary of Preston Plucknett, lying to the south of another Medieval field called Field's End. Preston Field was bounded by the parish boundary with Brympton in the west and to the east by the field access track known as Eighteen Acre Lane. By the time of the 1763 Survey of the Manor of Preston, the large Medieval field had been broken up into a number of smaller fields and Hundred Acres & Ellis's (an ironic name for a relatively small field) was one of these, located at the centre of the former North Field. The 1846 Preston Tithe Map shows the field called Hundred Acres & Ellis's (Parcel 54) bounded on the north by Church Acre (Parcel 59), to the west by Higher Preston Field (Parcel 58), to the south by Lower Preston Field (Parcel 55). To the east it abutted Long Close (Parcel 53) and Greeney Close (Parcel 52). The Preston Plucknett Tithe Apportionment of 1848 noted that Hundred Acres & Ellis's was owned by Lady Georgiana Fane of Brympton d'Evercy and the tenant was Thomas Hawkins (who was a tenant of over 200 acres in over 40 parcels in the parish). The field measured (in 'new' units) 6 acres, 2 roods and 14 perches and was used as arable land for growing crops. 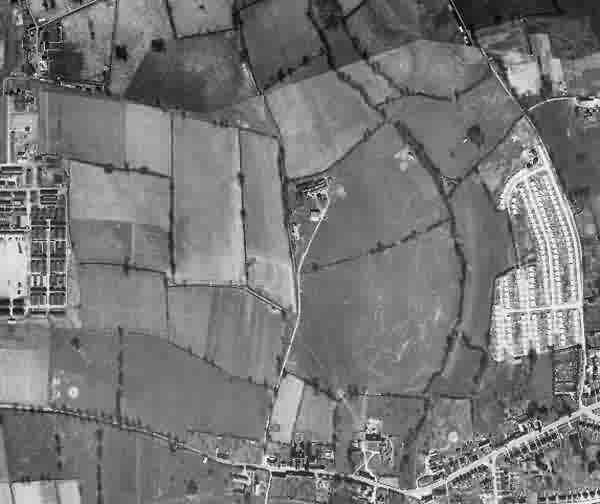 By the time of the 1946 aerial photograph (see below), Church Acre and Hundred Acre & Ellis's had both been included into Quarr Close (Parcel 59). 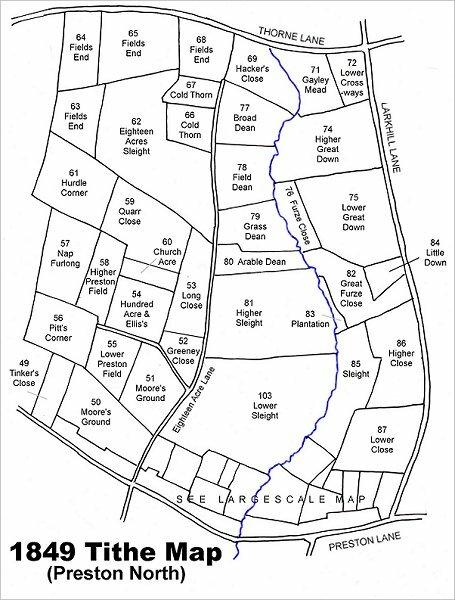 All remnants of the field finally disappeared when the Abbey Manor estate was built in the 1980s and the site of the Hundred Acres & Ellis's is now occupied by part of the middle section of The Toose with its various projecting culs-de-sac. The main post-Medieval fields of Preston Plucknett. 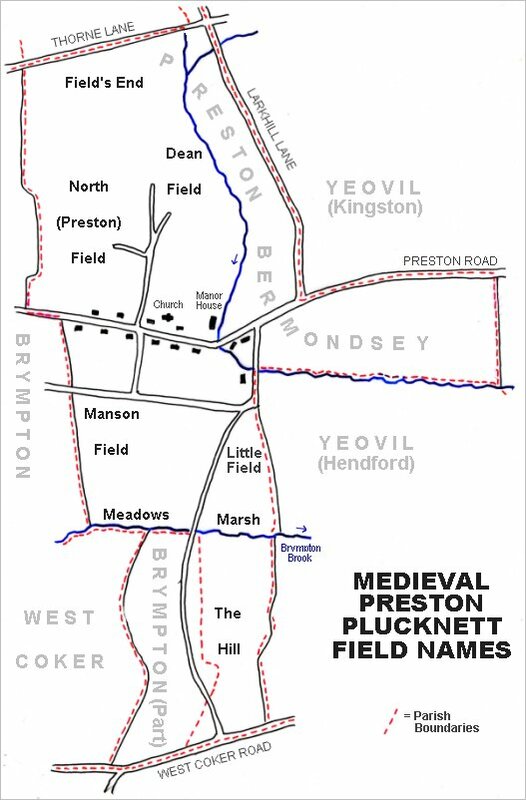 The original large Medieval manorial field called Preston Field, or North Field, lay to the north of Preston Road and west of St James' church. Map based on the 1849 Tithe Map showing Hundred Acres & Ellis's (Parcel 54) at lower left centre. This is a 1946 aerial photograph showing Houndstone army camp (at centre left). At centre is the Preston Plucknett Flax Works and at centre right is the post-war Larkhill Lane pre-fabricated housing estate. 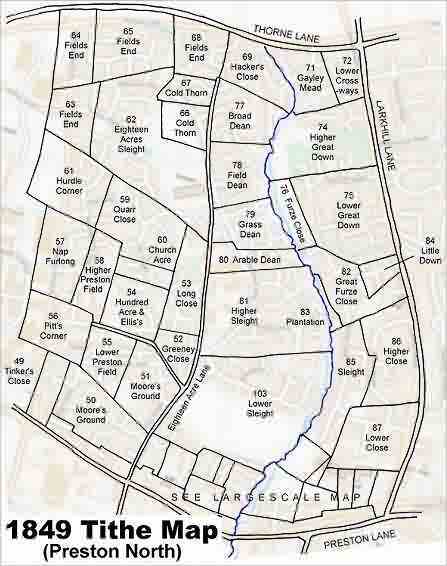 The enlarged Quarr Close is at centre left, one field away from the flax works. At this time it had absorbed Church Acre and Hundred Acre & Ellis's. The 1849 Tithe Map superimposed over the modern Ordnance Survey map.